A dramatic ending for an ambulance crew in the city of Puszczykowo, Poland. An Intercity crashed the vehicle blocked in the railroad crossing. The paramedic and the doctor on board died instantly. The third person driving the vehicle is very serious. WARSHAW– An ambulance entered a railroad crossing while a train was about to come, yesterday at 4 pm. The vehicle with a driver, a doctor and a paramedic on board have been blocked because of the bar closed. The impact has been tragic, and the doctor and the paramedic died after the crash, while the driver is seriously injured. He has been taken by the helicopter of the Air Rescue Service to the hospital. 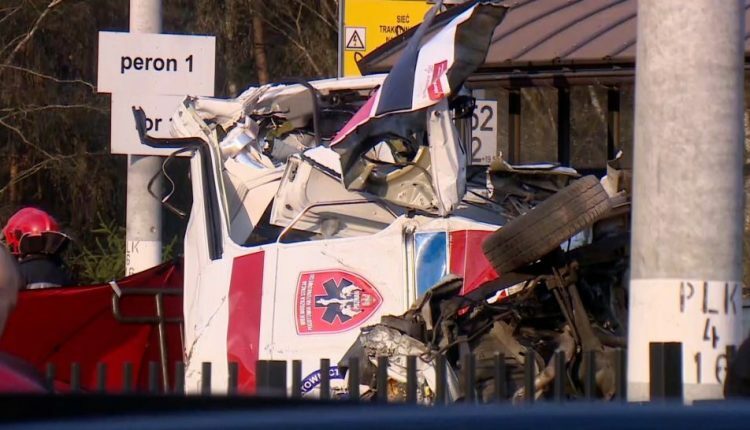 As the first information of Polish Police reports, the ambulance driver tried to park along the bars to get away from the railway, but everything has been useless. The Intercity swamped the ambulance. There was no patient in the ambulance. It is still not clear why the ambulance was in action in those moments. It is allegedly to say that they were about to reach a patient in serious conditions to transport him to the hospital in Puszczykowo to one of the hospitals in Poznań. However it is still not clear what kind of emergency has been sent to allow this ambulance to dispatch, neither if the first explanation of the facts is real. The authorities launched the first researchers and investigations to discover more.